It's time to look behind the green door of the Secret Seven's shed again. Enid Blyton's much-loved detective club are back in a superbly entertaining new adventure. With recent revivals of Agatha Christie's Poirot by Sophie Hannah and Dame Ngaio Marsh's Inspector Alleyn by Stella Duffy, among many other 'continuation' tales, I perhaps shouldn't have been surprised to stumble across this new instalment in one of my favourite childhood series. It's perhaps more remarkable, given Enid Blyton's massive popularity (half a billion sales, apparently, across her many series like Famous Five, Secret Seven, The Faraway Tree, Noddy etc), that it's taken half a century since her death for someone to bring her Secret Seven characters back to the page. The Famous Five are perhaps more, well, famous, but for whatever reason I actually read more of the Secret Seven growing up. Along with the Hardy Boys, they probably kickstarted my love of mystery stories. 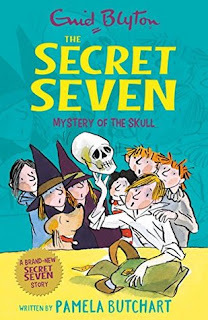 So it was with a smile on my face and a lovely sense of nostalgia that I began THE MYSTERY OF THE SKULL, which adds a sixteenth tale to Blyton's original 15 tales written between 1949 and 1963. Award-winning kids author Pamela Butchart has been handed the reins. It's been thirty-plus years since I've read a Secret Seven book, so I won't be able to accurately weigh up just how close or far from the original series this new instalment is in tone and atmosphere etc. But the 'old gang' are all back - Peter, Janet, Jack, Barbara, George, Pam and Colin. As well as dog Scamper and youngsters Susie and Binkie, who live to annoy the older sleuths. For me, THE MYSTERY OF THE SKULL read relatively timeless (eg no massive reliance on or reference to technology etc), while feeling somewhat modern rather than old-fashioned in tone. It's a nice little mystery with some spookiness running through it that could delight younger readers. The kids are at the forefront, the heroes who drive the story with their actions. There's plenty of action and intrigue, and some funny moments. Tony Ross's quirky illustrations add further flavour. 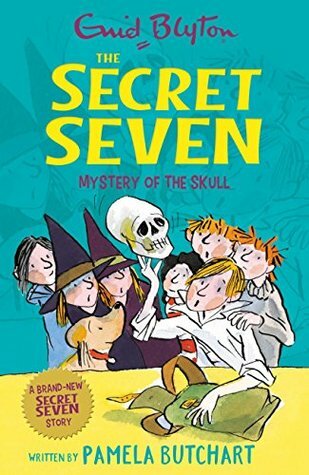 Overall I think younger readers would enjoy this mystery, and be prompted to give Blyton's original books a go. There's enough crossover for it to feel like part of the same whole, while not feeling out-of-date. I tore through this quickly, and had a smile on my face throughout. Blyton created an interesting dynamic between her adolescent sleuths, and Butchart has picked up the baton well. A fun, easy read recommended for younger mystery lovers, while still being a light and enjoyable palate cleanser for adult readers in among all the darker and more serious crime tales.